Flag droughts: How long has your club been waiting? 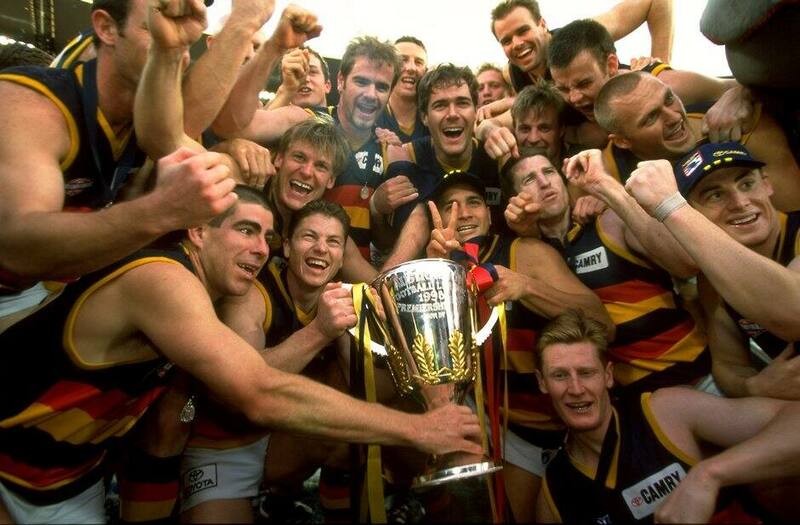 It's been a case of so near yet so far for the Crows since winning their first two premierships. The Crows have reached the finals in 11 of the past 18 seasons. Four of those runs finished with preliminary final heartbreak, with the most recent coming in 2012. The Crows have always been around the mark, making shrewd trades to bring in Eddie Betts and quality draft picks to remain in the hunt. Norm Smith medallist: Andrew McLeod going back to back. It's been just 13 years since the Lions finished off their historic hat-trick of premierships from 2001-2003. On that occasion they flogged favourites Collingwood by 50 points, led by Simon Black's Grand Final-record 39 disposals and five goals to Jason Akermanis. They made the decider the following year against Port Adelaide, but since then have contested the finals just once – in 2009. Things plummeted following the bungled recruitment of Brendan Fevola, and like most of the past seven seasons, the Lions again are in rebuild mode under new coach Chris Fagan. The Blues capped off a record-breaking season in 1995, winning the final 16 games to secure their 16th premiership. Apart from a brief resurgence under club great Brett Ratten, when they competed in finals for three consecutive seasons (2009-11), the past 21 years have been the worst in the club's history. The closest the Blues have come to a premiership was in 1999 when they were defeated by North Melbourne in the Grand Final. It's been only six years since the Magpies last saluted but it seems considerably longer, given all that has transpired since. The next year the Pies were conquered by just one team, Geelong, on three occasions including the Grand Final. The club then enacted its controversial coaching succession plan, replacing Mick Malthouse with Nathan Buckley, and Buckley has gradually overhauled the list while unexpectedly sliding down the ladder to fourth, eighth, 11th, 12th and 12th. They remain optimistic about a rapid rise built on talented youth. Norm Smith medallist: Lenny Hayes (St Kilda) in the drawn grand final and Scott Pendlebury (Collingwood) in the replay. Essendon's last flag was perhaps its greatest ever, as the Bombers ran rampant to record the best single season by a club in the game's history. The Bombers lost just one game for the season en route to their 16th flag, winning 24 of a possible 25 games, and they thumped Melbourne by 10 goals in the Grand Final. The Bombers blew a great chance to claim back-to-back flags the following year when they took a bunch of injured players into the premiership decider against the Brisbane Lions, and haven't been close to adding to their trophy cabinet since. They haven't even won a final since 2004, meaning only Richmond has a longer drought since a finals win (discounting Gold Coast as a new side in the competition). Striving to become one of the greatest teams of the modern era, and win its third premiership in five years, Geelong achieved the feat with victory over Collingwood. It was a coming of age for young forward Tom Hawkins, who played the best game of his career, hauling in seven contested marks – the most ever recorded in a Grand Final. A trademark Jimmy Bartel performance saw him adjudged best on ground, while Steve Johnson booted four goals with a dislocated kneecap. It was also coach Chris Scott's first year in charge at the Cattery. The Cats have made two preliminary finals (2013 and 2016) in that time, but are still searching to return the big match. The Hawks quest for a fourth-straight flag ended after a straight-sets defeat in the finals. But they're reloading quickly to contend again next year, with former Tiger Ty Vickery already on board as a much-needed ruck/forward role. Will Jaeger O'Meara follow him to Waverley? The Hawks will be hoping to secure him to help cover the loss of champion midfielder Sam Mitchell. If they do, the top four beckons for the Hawks again. After the Western Bulldogs' premiership triumph this season, Melbourne now holds the longest flag drought. Their last premiership victory came in 1964 when legendary coach Norm Smith won his sixth VFL premiership. The Demons have appeared in just two Grand Finals since, in 1988 and 2000. The Demons, who led by 11 points at the final change, surrendered the lead to their rivals in the fourth quarter but a late winner from defender Neil Crompton ensured the flag was theirs. Smith was infamously dismissed from his coaching job the following year, sparking the so-called Norm Smith 'curse'. Norm Smith medalllist: The Norm Smith Medal, named after the Melbourne coach, wasn't struck until 1979. The Roos sought redemption after kicking themselves out of the 1998 Grand Final and overpowered Carlton by 35 points, a week after the Blues clinched an a famous prelim final victory over Essendon by a point. North's triumph marked the club's second flag in four seasons and was the beginning of the end of the Kangaroos' dominant era. The next year was the last of their seven successive preliminary final appearances and North hasn't been back to the big dance this century. The Power's hopes of going back-to-back ended with a semi-final loss to cross-town rivals Adelaide. Then came the embarrassing 119-point flogging by Geelong in the 2007 Grand Final, after which the Power missed the finals for five straight years. The Cats again ended their chances in 2013 before a gut-wrenching three-point preliminary final loss to Hawthorn the following year. The Power have missed the finals the past two years and appear some way off challenging for a flag. Now a Richmond 'immortal', it was Kevin Bartlett who led an 81-point thrashing of Collingwood in the Tigers' last premiership in 1980. The club's 10th flag marked the end of a highly successful 13 years that netted five premierships. The club has since played in one Grand Final (1982) and just six finals series. The Tigers looked to be on the right track, playing in consecutive finals in 2013-15, but now appear to be in rebuild mode once more with no indication when their breakthrough flag will come. Since St Kilda's first and only premiership, it has played in five Grand Finals. In 2010, the Saints drew with Collingwood before losing the replay. The previous year ended in defeat at the hands of Geelong after finishing 20-2 during the home and away season. Darren Jarman booted six goals as Adelaide overcame a half-time deficit in 1997 to topple St Kilda and Hawthorn was the Saints' conqueror in 1971, by seven points. Norm Smith medallist: Not awarded but St Kilda historian Russell Holmesby rated Ian Stewart the best player that day, with Ian Cooper also having played very well. The Swans have come extremely close to adding another premiership to their 2012 triumph, but just can't quite turn regular season results into flags. They lost the decider in 2014 to Hawthorn, and this year to the Western Bulldogs, went down to Fremantle in Perth in the 2013 preliminary final, and lost two finals in 2015 after finishing in the top four in all four years. With a star-studded midfield and some quality young talent coming through, there's no doubt the Swans will be a chance again in 2017. The Eagles celebrated the 10-year anniversary of their last premiership triumph this year. Only one 2006 premiership player, Sam Butler, is still playing. They had a dramatic fall from grace following that triumph with the well-documented illicit drug issues surrounding the club. The Eagles made the top-four in 2007 but were knocked out in straight sets. They struggled for three years before returning to play in a preliminary final in 2011. Another dip in 2013 led to John Worsfold's resignation. Adam Simpson took the Eagles to a Grand Final in 2015 but the Hawks were far too good. The Eagles also fell well short in the elimination final this year against the Western Bulldogs despite winning 16 home and away games. The competition's longest drought broke nearly two weeks ago and it brought unbridled joy to the red, white and blue faithful, who had endured 62 years since the club's one and only flag in 1954. The football world rejoiced as the Dogs finally had their day and grown men shed many a tear as Luke Beveridge and Easton Wood held aloft the premiership cup.